1. I have translated the entire Bible from Latin into English. The work of translating the entire Bible took me just over 5 years, from mid March of 2004 to late March of 2009. During that time, I worked on the translation nearly every day, usually seven days a week. I used the Pope Sixtus V and Pope Clement VIII Vulgate as the Latin source text (consulting several different editions), and I used the Challoner version of the Douay Bible as a guide to my translation. I have placed this translation entirely in the public domain, with no copyright or trademark. I believe that the Bible should be freely available, and not be encumbered with copyrights or other restrictions. 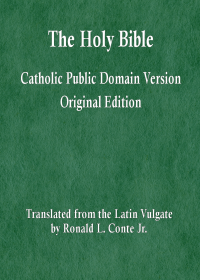 My translation of the Bible is called the Catholic Public Domain Version (CPDV), and is available online at SacredBible.org and in print. 2. I have edited the entire Latin Bible, and have published this edition online at SacredBible.org. This edition of the Latin Bible is also in the public domain. It is a light edit of the Clementine Vulgate Bible. 3. I have also published online a Latin-English Bible containing my edit of the Latin Bible, my translation of the Latin (the CPDV), and translation commentary. 5. I worked on the World English Bible project, with some of the Deuterocanonical books (Tobit, Judith, Esther, Baruch, Jeremiah’s Letter, and Daniel). 7. I lead an online Bible study at CatholicPlanet.net. The chapter by chapter study began in September of 2006, and we are now (July 2011) close to completing the New Testament. 8. I wrote and published a book on the subject of New Testament Biblical chronology: Important Dates in the Lives of Jesus and Mary. I spent between 4 and 5 years researching and writing this book. The timing of various important events in salvation history is analyzed, from the Immaculate Conception of the Virgin Mary, to the Birth of Christ, to the Crucifixion and Resurrection, through various events in the early Church. 10. I have spent many years studying the eschatological level of meaning in Sacred Scripture. I have written several books and many articles based on my insights and conclusions from that study. The term Roman Catholic applies to my work because I am a baptized and confirmed, believing and practicing Roman Catholic, and I study and write from faith and reason, not solely from scholarship. This approach stands in stark contrast to most modern Biblical scholars, who believe, and even openly state, that the Bible should be interpreted without faith. They criticize any fellow scholar whose eye is more readily guided by faith than by scholarship. 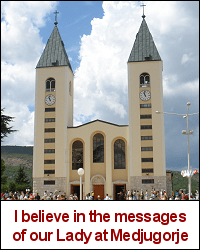 The term Roman Catholic applies to my work because I believe the teaching of the Popes and Councils of the Church that Sacred Scripture is entirely inspired and entirely inerrant, not only on matters pertaining to faith, morals, or salvation, but on every matter about which Scripture makes an assertion. This teaching of the Catholic Faith is certainly infallible under the Universal Magisterium, and may well be infallible under Papal Infallibility (Pope Leo XIII, Providentissimus Deus, n. 20). However, most Catholic Biblical scholars have rejected, often with scorn and derision, the teaching of the Church that everything asserted by the inspired authors of Sacred Scripture must be held to be asserted by the Holy Spirit (cf. Second Vatican Council, Dei Verbum, n. 11). The term Biblical scholarship applies to my work because I have spent many years studying Scripture, writing about Scripture, translating Scripture, editing and publishing Scripture, defending the inspiration and inerrancy of Scripture, and defending all of the teachings of Sacred Scripture without exception, in season and out of season. If anyone says that my work with Sacred Scripture is not substantial, let him present his own work for comparison. Gallery | This entry was posted in Biblical chronology, Scripture, theologian. Bookmark the permalink.